There are so many things to consider in trying to be present with people as they explore dreams and options for the life they most want … voice, power, rights, community, deep listening, creativity, respect, gifts, stories, relationships…all of these and many more are part of the picture. And because we are offering help…as facilitators, families and friends… the nature of how we help is foundational to our desire to make a difference. How Can I Help? 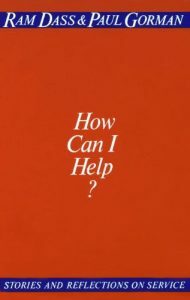 offers wonderful stories from people in a variety of helping professions, including doctors, nurses, social workers, clergy, peace activists, third world development workers and many others, sharing what they have learned about “helpful help” in Chapters entitled Natural Compassion; Who’s Helping? ; Suffering; The Listening Mind; The Helping Prison; The Way of Social Action; Burnout; and Reprise: Walking Each Other Home.